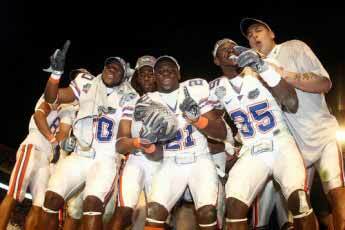 The Florida Gators celebrate winning the BCS National Championship for the 2008-2009 season on Jan. 8, 2009. Many football fans argue that a playoff system should replace the BCS. They contend that it is the only fair way to determine a national champion and that the BCS method is subjective, profit-motivated, and sometimes leaves the best teams out of the championship game. Opponents argue that the BCS system is in the best interest of the athletes, fans, and sponsors because the bowl games generate huge profits for schools and their local economies, keep the season shorter for student athletes, and almost always have the two best teams playing each other for the national title. 43% of Americans say that football is their favorite sport to watch, more than three times any other sport. In 2008, a record 37.5 million people attended college football games. 120 colleges and universities compete in 34 post-season bowl games, and one of the schools (and sometimes two) is crowned national champion each year. The National Collegiate Athletic Association (NCAA), the governing body for college sports, does not recognize an official college football national champion and therefore has not established any rules in this matter. Since Princeton and Rutgers were declared the first national champions in 1869 (1.3 MB) , the best college football team has been determined by media polls, coaches polls, and mathematical rating systems but never a playoff system. 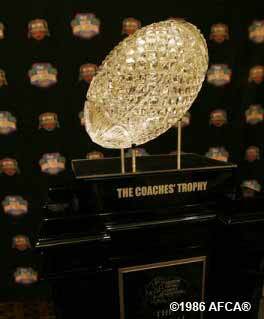 The Bowl Championship Series (BCS), a self-described "five-game arrangement for post-season college football," is a system that ranks teams and matches the top two in the national championship game to determine the national champion. The annual controversy about whether the BCS should be replaced by a playoff system centers on the BCS rankings (also called standings). The BCS standings are calculated by averaging three elements: the Harris Intercollegiate Football Poll, the USA TODAY Coaches' Poll (which replaced the Associated Press Poll in 2005), and the average of six computer rankings. Proponents of the BCS say their rankings are as accurate as possible because the BCS incorporates human polls and computer ratings to calculate the standings, but critics counter that the BCS rankings often place teams in the wrong order and discriminate against smaller schools. The number one and number two teams, selected by the various polls and ratings used over time, played each other in bowl games eight times out of 57 seasons (14%) between 1936 and 1992, when the first bowl coalition (a bowl agreement preceding the BCS) began. Since the creation of the Bowl Championship Series, the top two teams according to the AP poll have met eight out of 11 seasons (73%), a fact that the BCS proponents consider to be evidence that the system is working. USC fans show their support for a playoff system. Fans nonetheless argue that the teams selected to play for the national championship are not always the two best teams. The University of Utah (in 2004 and 2008) and Boise State University (in 2006) were excluded from the national championship game despite being undefeated while teams with one or more losses played for the national title.In 2003, for example, the top three teams finished the season with one loss each. The University of Southern California (USC) was ranked number one by the two human polls but the computer rating placed USC at number three and thereby excluded them from competing in the national championship. The AP poll chose USC as the national champion while the coaches' poll selected Louisiana State University, so the national championship was split in 2003. The various polls and ratings used since 1869 have selected more than one team as the national champion in 110 of the last 140 years. Six conferences (ACC, Big 12, Big East, Big Ten, Pac 10, SEC) plus the University of Notre Dame had existing bowl agreements before the BCS was formed in 1998, so the BCS rules were written to guarantee automatic entry into BCS bowl games for the champions of those six conference. Schools in those conferences are called BCS teams, while schools in the five conferences that are not guaranteed a BCS spot are referred to as non-BCS teams. A non-BCS team can earn a spot in a BCS bowl game by finishing in the top 12, or if it is ranked in the top 16 and ranked higher than at least one team from a BCS conference. 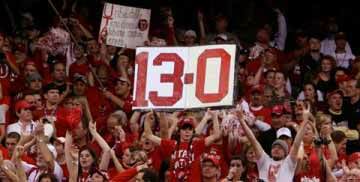 University of Utah fan boasting that the Utes were the only undefeated team in 2008. The Utes finished 6th in the BCS ranking. President Barack Obama stated his support for instituting a playoff system on the Nov. 16, 2008 CBS television program 60 Minutes, "If you've got a bunch of teams who play throughout the season and many of them have one loss or two losses, there's no clear, decisive winner. We should be creating a playoff system... It would add three extra weeks to the season. You could trim back on the regular season. I don't know any serious fan of college football who has disagreed with me on this." Congressman Joe Barton (R-TX) introduced the College Football Playoff Act of 2009  on Jan. 9, 2009 to make it illegal to promote, market, or advertise a post-season game as a championship or national championship game unless it was "the final game of a single elimination post-season playoff system." The bill was approved by a subcommittee of the House Energy and Commerce Committee on Dec. 9, 2009, and it goes to full committee next, although a hearing has not been scheduled. Senator Orrin Hatch (R-UT) claimed that the BCS violates the Sherman Antitrust Act, which prohibits contracts or conspiracies to limit competition, because the University of Utah was not selected to play in the 2008 National Championship Game despite being the only team to go undefeated that year. After over 140 years without a playoff system, the BCS Presidential Oversight Committee approved a four-team college football playoff on June 26, 2012. The Division I Board of Directors approved legislation to allow the student athletes to participate in the additional post-season game at a meeting on Aug. 2, 2012. The new Football Bowl Series (formerly Division I-A) playoff is scheduled to begin in the 2014-15 season and continue through the 2025 season.